As Tokyo Fox is slowly running short of films ‘set’ in Japan to review, it’s time to start a new series analysing those movies inspired by Japan that have been set in other countries, most commonly the USA. Having been to the new Hachiko statue at the University Of Tokyo recently, the Akita dog was very much on the brain so I guess this Lasse Hallström-directed re-make is the perfect place to start. This tale of loyalty and devotion starts off in the present with kids doing presentations in class on the subject of their hero. Amid a few sniggers of laughter, one boy tells his classmates that his hero is Hachiko and from thereon the mysterious story of how the dog ended up on a plane from Japan to Boston (USA) unfolds on screen. Thankfully, the kids presentation is done off screen and the story of Hachi is not narrated. Based on the 1987 Japanese language movie (which in turn was based on a real story) this movie, starring Richard Gere, took the story to a far bigger audience so these days the influx of tourists to Tokyo already know the backstory behind the statue outside Shibuya station which does appear briefly at the end of this movie. 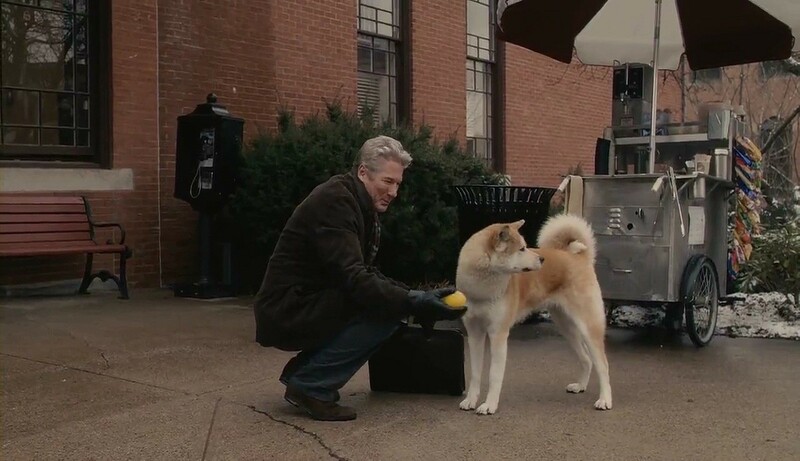 Richard Gere is of course no stranger to movies about Japan having made a guest appearance in the Akira Kurosawa directed movie ‘Rhapsody In August‘ (1991) and here he plays Professor Parker Wilson, the guy who takes the stray dog home with the intention of returning it to its owner. However, that never happens for one reason or another and before you know it many years have passed and the bond between owner and dog is very tight. ‘Hachi‘ is an extremely simple movie but one where you’re captivated from start to finish and to his credit, Hallström just lets it run along at a nice pace. Anyone with half a heart is moved by this story and it shows the bond that can develop between owner and dog which is perhaps most prevalent in one scene where Joan Allen’s character looks out of the window and sees her husband playing with the dog and the love and affection he gives it. Gere comes across as heart warming and credible in his role especially the scenes involving teaching the dog to run and fetch. Animals, particularly dogs, are very precious (sometimes too cherished!) to people in Japan and nowhere is that more noticeable than with the story of Hachiko. Of course all Japanese people know about this story but for other nationalities it’s important to note that this is not quite the family movie they may expect! This 93 minute movie is a lovely break from the more typical modern-day fast paced, action packed films and is instead a tender story of friendship, love and loyalty. However, it’s not like that all the way through as in the second half of the narrative it seems like the scriptwriters stumbled around a bit regarding how to deal with the transition following Parker’s sudden heart attack and how Hachi is discarded with so easily and quickly by his family in the wake of that tragedy. “We want you to stay here with us but if you have to go thats ok too” are the words uttered by Parker’s daughter as she just gives up on Hachi and sets him free to choose his destiny. Would anyone really ever be so heartless?! I guess this had to be done though to give us the story of Hachi continuing to wait for his master at the station each night (did he know to just wait on weekdays only? Every single day?!) for the next nine years. When watching this 2009 film I never fail to well-up inside and love the film all the more for there’s no false over-the-top sentimentality. I enjoyed the dog-cam more than I thought I would as it allows the viewer to see the view of the world around Hachi. 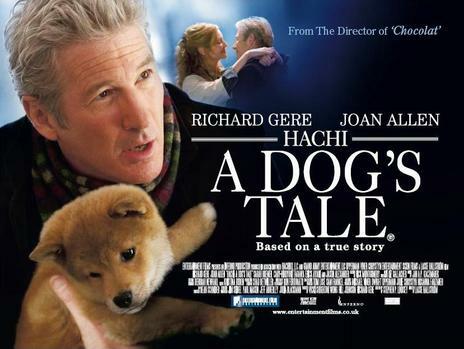 It’s not quite the perfect film but such a touching one and I don’t think it really matters that the support cast were so under-used (as some have suggested) as most viewers are only interested in Richard Gere’s character and his relationship with his beloved Japanese Akita dog. This entry was posted in Japan Life, Review: Films Inspired By Japan and tagged Akira Kurosawa, Akita, Hachi; A Dog's Tale, jr shibuya station, professor ueno hachiko statue, rhapsody in August review, tokyo fox, where is Hachiko's grave?. Bookmark the permalink. Thanks for the heads up. I definitely want to check out this movie now! I am also a sucker for these feel good type movies. not sure if this is your conventional feel-good movie! Probably not in the ‘conventional’ sense though I get the idea it is about love and commitment. These things bring strong emotion to people, including myself, at times. Both emotions of longing and ‘feel-goodness’. They have it at my library and I just put in a request for it. Should have it in the next couple days. Nice. Let me know what you think of it when you’ve stopped crying! Right? I AM sappy like that. “Ice Castles” gets me crying every time! I am halfway through. I think Wilson is off to work for the last time and Hachi senses a problem. I like the dog-cam too. Good stuff there. Two things I don’t dig so far… 1) The fact it is set in America and 2) Why was Hachi put on the plane? I am only 50 minutes in and so maybe that will be answered but seems weird and other than paying homage to the Japanese origin, they could have just completely left the Japan part out. What is the name of the Japanese version? Ah. Thank you. 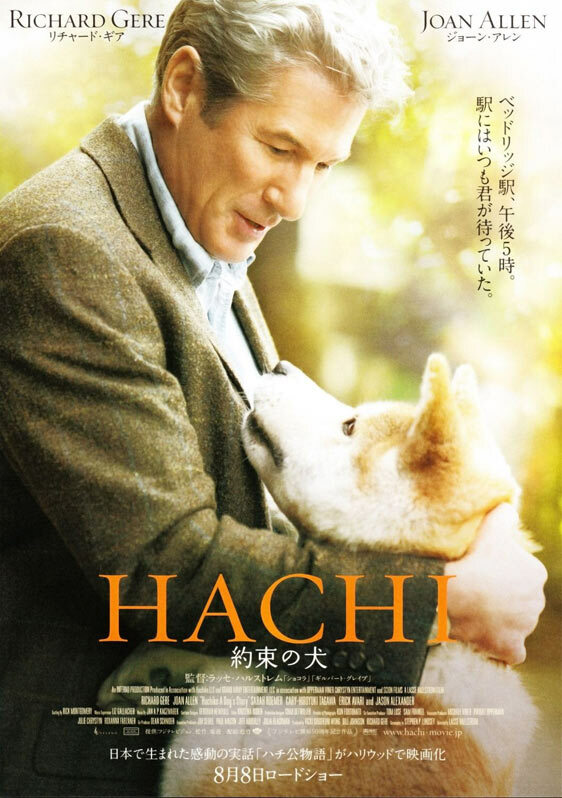 It was interesting to me that Hachi: A Dog’s Tale was not released in American theaters.